Consider donating used surfboards to a community thrift shop. Call ahead to see if they accept surfboards. See the Donation Locations page for information on local donation and reuse centers. The ReSurf Club accepts old surfboards, refurbishes them and then uses them to teach kids around the world how to surf. Find out how you can donate your board. Surfboards are difficult to recycle, so consider purchasing a gently used board. 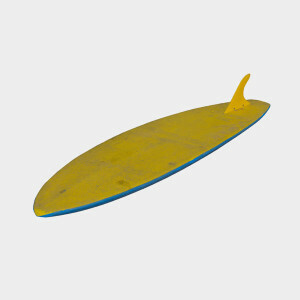 BoardRecycler is a site that has online listings of surfboards for sale. Find out more about BoardRecycler. Most surfboards are made from fiberglass and polyurethane foam, which are toxic materials that can pollute the water and soil. Look for an ecofriendly board made from biodegradable material, like balsa wood, agave, bamboo or soy. Over 600 pounds of carbon dioxide emissions are produced during a shortboard’s life cycle. This life cycle accounts for CO2 emitted during manufacturing, repairs, and disposal of the board. According to the EPA calculator, the CO2 from a single board’s life cycle is the same as burning over 290 pounds of coal.